If you are looking for fake security cameras protect your home or a business without spending hundreds or thousands of dollars, you are in the right place. We offer a select range of professional looking dummy security cameras that cost you very little. 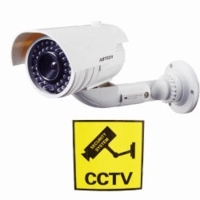 We provide indoor and outdoor quality dummy CCTV cameras at low cost with easy maintenance and installation. Installing our fake security cameras is a very cost-effective way of protecting your premises. You can use these fake cameras as a deterrent to make people think that real surveillance cameras are in operation. You can use these dummy cameras in conjunction with real surveillance cameras to expand your current system and create an impression for the thieves and intruders that more areas are covered by tight video surveillance. Most of our dummy cameras stand the test of time with their real look and durability. Our fake security cameras are widely used by security professionals, business and home owners. Fake Security Cameras are getting more popular as they have been proven to deter theft in actual tests. Its human nature to find the easy target and property obviously under surveillance is not the thief's first choice. Use these dummy surveillance security cameras to protect your home, parking lot, church or business, school or any property where you's like to make things a bit tougher for the bad guys.